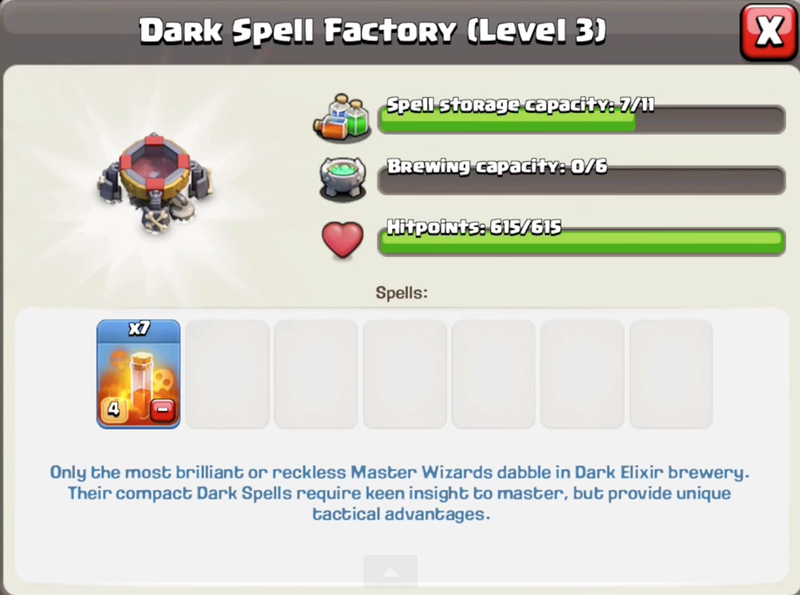 Dark Spell Factory and Poison Spells in June 2015 Update! YES, the Dark Spell Factory is official! 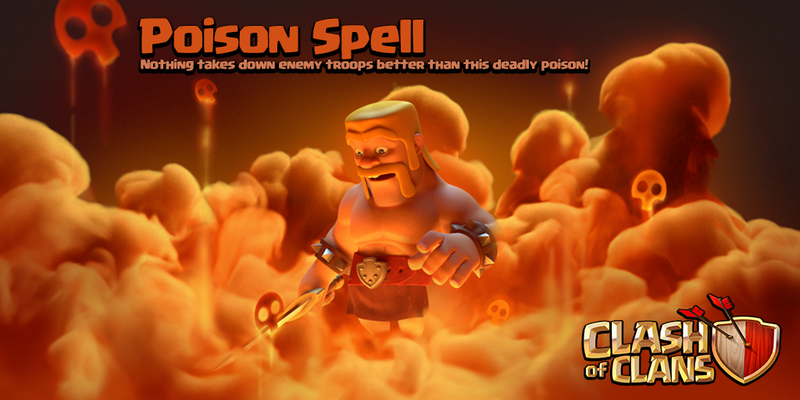 Today, Clash of Clans announced that the poison spell will be included in the June 2015 Update! This Poison Spell will take the place of a lightning spells; it is used to kill the enemy Clan Castle and heroes. So how many spells can you train in the Dark Spell Factory? What other spells will there be? There was a lot more insight provided on the Dark Spell Factory today! Each dark spell will take up 1 space, while each of the elixir spells now takes up 2 spaces. Not to worry though, you don’t only have 5 space for a level 5 spell factory anymore. Here are the ranges based on Town Hall level. So now that elixir spells take up 2 space, it actually increased the number of spells overall. You can bring 2 rage, 2 freeze, and 3 poison spells for a Town Hall 10. We will see what the other spells are soon, but this completely changes the game. Note: You can also now QUEUE spells, something we have needed forever! Like I said earlier, the Poison spell acts kind of like a lightning spell when used against Clan Castle troops. You lure out the Clan Castle and then get them unmoving. Then you drop 1 or a couple of poison spells to completely take the CC. Of course, it varies based on health, but it seems that barbarians, archers, wizards, and minions can all be taken out using TWO or less of these poison spells. So that was only the first spell that Clash of Clans sneak peeked! We aren’t sure how many spells are going to be in the Dark Spell Factory, but my guess would be either 3 or 5, progressively increased when upgraded. There’s lots of speculation on the new spells but the leading ones right now are the poison, earthquake, and haste. So that’s it for today’s sneak peek! Make sure to check back in tomorrow for the very next one! I’ve heard there is going to be a mortar level 9.